The antioxidant ability of this coffee substitute could reduce inflammation and cell damage. 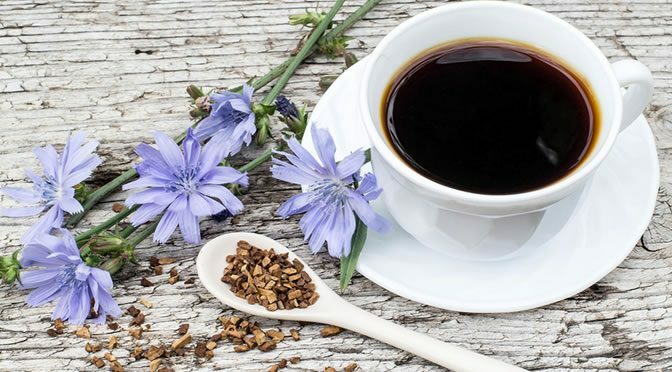 A component of chicory could offer a natural therapy in reducing memory impairment related to Alzheimer’s. It could even be an effective treatment for other neurodegenerative diseases. Chicoric acid with its antioxidant ability can reduce inflammation and cell damage. Based on this fact, the research team examined the probable protective effect of chicoric acid against memory impairment generated by large molecules called lipopolysaccharides (LPS). Previous studies suggest that LPS induces neuro-inflammation causing cognitive impairment by increase of beta-amyloid production. Beta-amyloid proteins play a key role in Alzheimer’s disease as they form amyloid plaques in Alzheimer patients’ brain cells. In this study mice were divided into three groups; one was a control group, the other group received LPS and the third group was treated with chicoric acid plus LPS. The learning and memory abilities of all mice were assessed by two different behavioural tests. The team found that the mice treated with chicoric acid plus LPS completed the tests in less time compared to the other groups, suggesting chicoric acid decreases the levels of LPS-induced memory problems. Chicoric acid did reduce neuro-inflammation and prevented the accumulation of beta-amyloid proteins caused by LPS injections in mice. Though the findings are promising, more research is required to ensure Alzheimer’s patients can benefit from chicoric acid. “These are provocative findings, but with the caveat that the LPS regime is not likely a model of long-term memory impairment. The study was published in The FASEB Journal (Liu et al., 2016).